When alt-rockers Nine Inch Nails and Joy Division and jazz giant Miles Davis are given nods in a hip-hop album, one cannot help but become intrigued by an unlikely crossover. 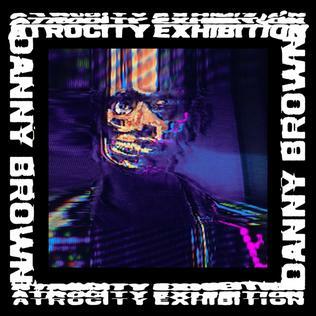 Enter the enigmatic Danny Brown, Detroit based emcee, someone with a delightfully tortured soul. “Atrocity Exhibition”, an experimental work revolving around the themes of mental illness, sexual deviancy, and drug addiction offers a keen insight into the existential journey of an artist weighed down by the superficiality of his “Rockstar” lifestyle. I have never been a regular consumer of hip hop music, and am sometimes appalled by the amount of profanity and misogyny in the genre’s mainstream. My own tastes are irrelevant to this review, but worth noting, as I address the album from an outsider perspective. My friend, a total hip-hop wonk (for lack of a better term) recommended it to me. And it didn’t disappoint. Despite some of the surreal sexual fantasies, and ham-fisted phallic wordplay there is much more to this album than the common hip hop tropes that it utilizes. The record opens with Brown’s voice, a high-pitched rasp of sorts, spitting a frustrated anecdote over a “broken time” drum beat and haunting saxophone arrangement. The sporadic tempo shifts juxtapose with the artist’s fluctuating psychological state, and shimmering horn lines echo the voices in Brown’s head as he spirals into drug infused paranoia. The lyrics certainly dabble into absurdity at times, but the emotional ingenuity seldom fades away, The artist’s cocksure bravado is only a smokescreen, thinly veiling his feelings of depression. Rapping in a percussive, grinding vocal style, Brown suggests extreme self-awareness. The rapper’s bitterness toward the destructive lifestyle he has superimposed on himself is undeniable. At times, his bitterness becomes manic, but there is a consistent sadness beneath Brown’s verses, even as he launches into fraternity pleasing party-bangers such as “Pneumonia”. The album’s chaotic themes are mirrored in its instrumental variety. The producers borrow stylistic components from a diverse body of genres. On one end, choppy rhythmic patterns parallel the pounding heart of an anxious narrator, self-medicated with speed and prostitution. The lazy, sunshine-tinged guitar melodies, warm bass fuzz, and ethereal choruses mirror the sleepy effects of heroin. Elements of dream pop, industrial, punk, and rock are all utilized within a hip-hop context. Perhaps most intriguing is the heavy Jazz influence. The odd time shifts, use of horns, and reference to. Miles Davis’ “Kind of Blue” are clear indicators of Brown’s familiarity with hip hop’s hard-bopping cultural predecessor. Davis and Brown share certain characteristics, both musically and otherwise. Aloof, wildly expressive, idiosyncratic and extremely intuitive to the human condition. Oh, and both struggled with cocaine addiction and intense feelings of social alienation. While Brown may not have the elevated cultural status of Davis, and hip hop has yet to attain the sanctification as an American art form that Jazz has, I certainly appreciate his ability to draw similarities between jazzmen and rappers. Not only with the larger-than-life personas of individual musicians, but also with their respective cultural birthplaces. Lofty comparisons aside, the album’s gritty texture could be inaccessible to the average listener. The hammering rhythms and asymmetry is a challenge to those more accustomed to traditional pop sensibilities. Brown does not utilize a traditional hip hop flow. Rather, he barks his lyrics in an aggressive style more reminiscent of Minor Threat than Nas. The abrasive qualities of this record, while consistent with the themes, just isn’t a smooth listen. While many of the messages conveyed are fairly universal, their accessibility could be hindered by the overall messiness of the song structures. However, the utilitarian appeal of an album is only as important as the artist determines it to be; and overall Atrocity Exhibition is a solid piece of gritty hip hop storytelling, driven by the emotional depth of the album’s concept, and brought to life by a potpourri of cross-genre influences.